Mission: Hometown Warrenton, Inc. promotes community development through downtown revitalization, historic preservation, tourism, and education. Vision: Our vision is to help create a unique and vital downtown that enriches the business community, embraces history, celebrates the arts, and promotes quality events to instill a 'sense of place' in our community. Our vision is to build a vibrant & prosperous community through business leadership and diversity. 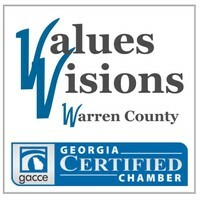 The purpose of the Warren County Chamber of Commerce is to conduct activities and solve problems to create a more competitive business climate for companies located in Warren County, Georgia.